Published Articles Archives | Page 2 of 2 | Masonry Technology, Inc. 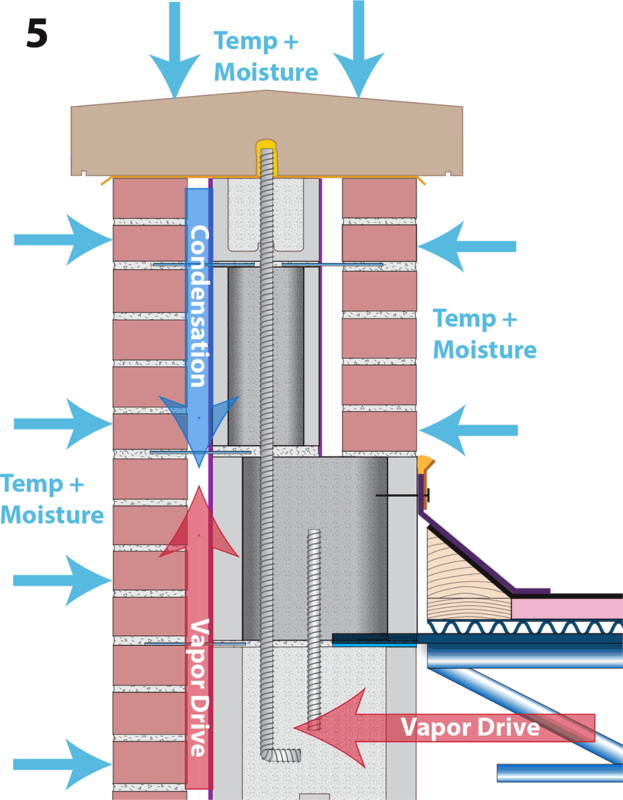 Most exterior surfaces of a vertical wall system do allow some moisture to penetrate deeper into the exterior building envelope. Why do building professionals allow this; don’t we have adequate waterproofing systems? 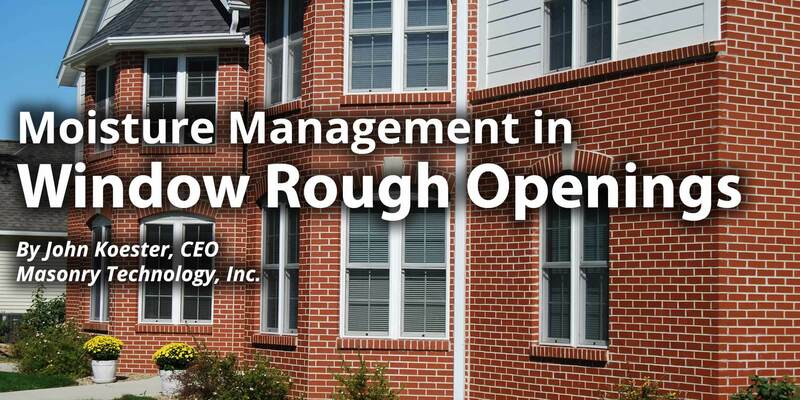 Part of the answer is “Of course we know and of course we do, but that isn’t the hole/whole story!” The hole/whole story, the more complete story, is that some exterior building surfaces of the exterior building envelope are responsible for more than just moisture management. These responsibilities include aesthetics, structural support, signage support, mechanical support and protection (veneers acting as shields). In addition to all these responsibilities, they also have to manage moisture! So the hole/whole story is a little more complicated! 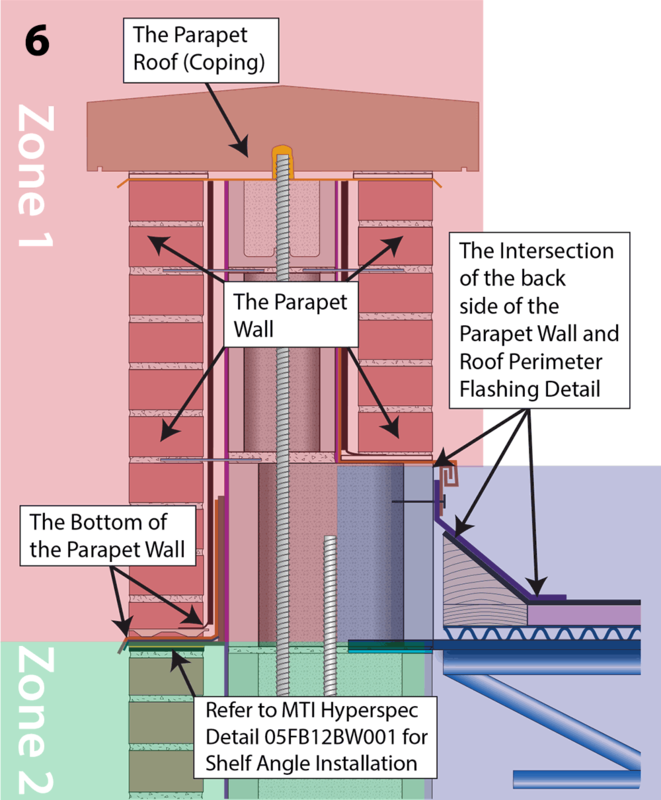 As part of the process of moving forward, let’s take a look at an example of a typical exterior wall (exterior building envelope). 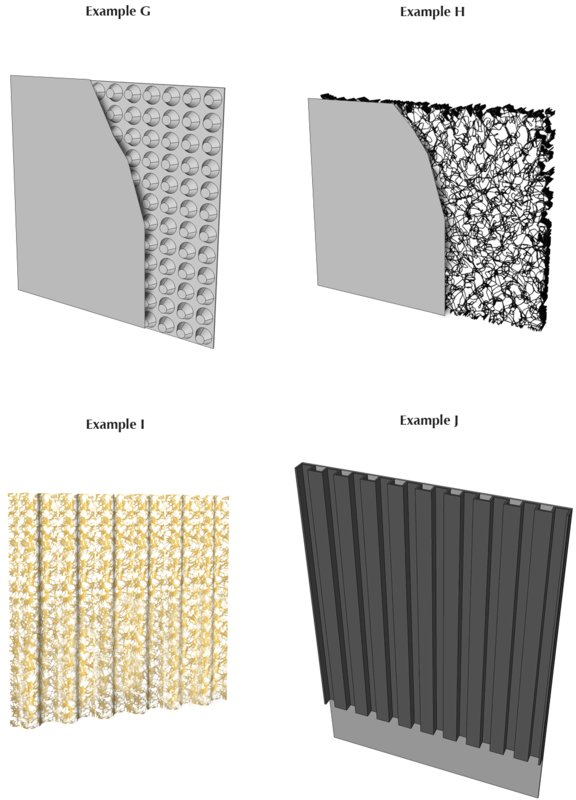 Obviously, there are many types of wall systems, but let’s use this one (Figure 2.) to simplify the discussion as much as possible. 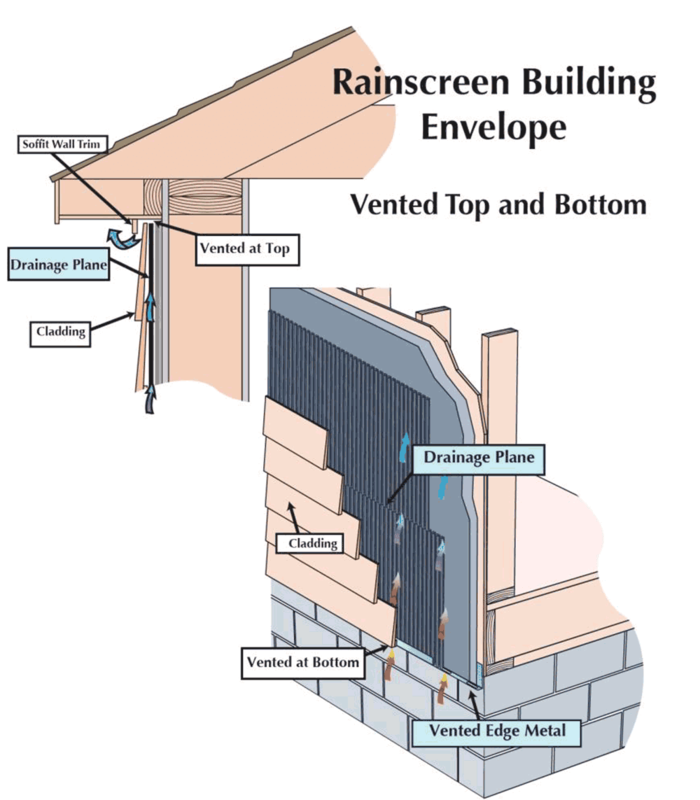 The Rainscreen is the most exterior surface of an exterior building envelope. It is the first surface that has the potential to change the exterior environment to satisfy a desired interior environment: wet to dry, hot to cool, cold to warm. It can be constructed of various materials including brick, stone, stucco, steel, wood, glass, plastics, and fabrics. The next section, the Rainscreen Drainage Plane, is the space from the backside of the rainscreen to the front surface of the moisture resistant material. It can be either a wall design feature (such as a space) or a product. 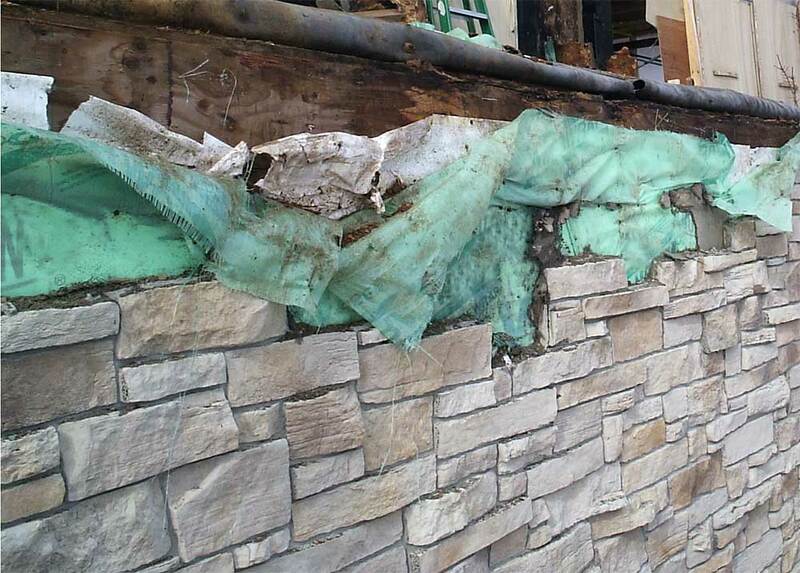 The third section, the Water Resistive Barrier, can be a waterproofing product (usually a sprayed or rolled on chemical compound) or a weather-resistant material (two layers of construction paper or a building wrap). It can also be both. The final section, the Structural Wall, can be composed of a variety of materials including wood or steel studs, cmu or poured concrete. In most cases there is a requirement for insulation. It comes in many forms and can be placed in various locations in this detail. It is an extremely important and extremely complicated character in the hole/whole story and must be included in the moisture management equation. (Figure 3.) 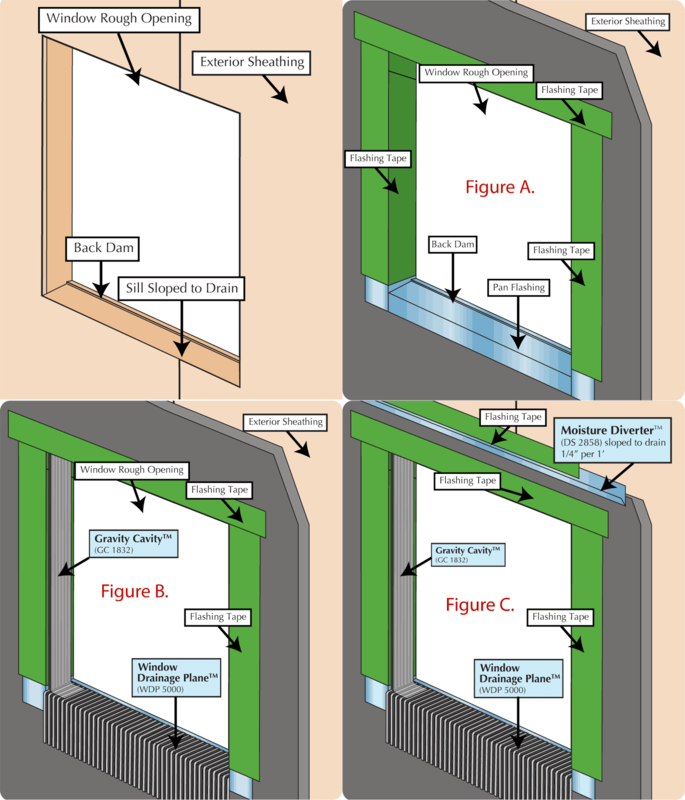 All forms of insulation involve unique moisture management issues that are beyond the scope of this article; however, they must be seriously examined when constructing a moisture management plan for the rainscreen building envelope. 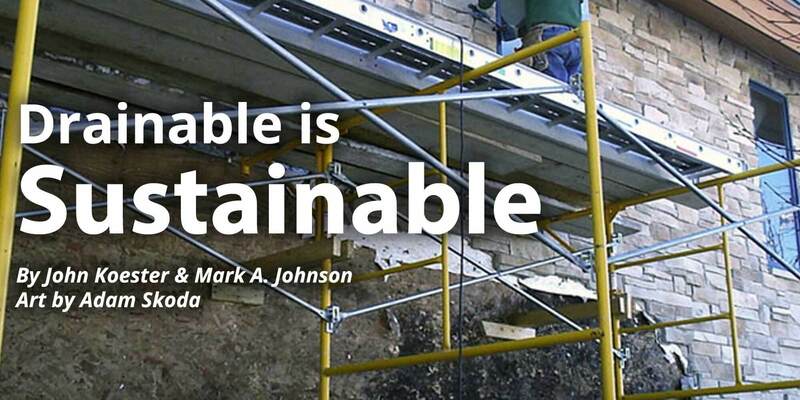 Enter the key phrase sustainable rainscreen building envelope into Google and you will get more than 18,000 results, including MTI’s “Drainable is Sustainable” presentation delivered at last fall’s technical meeting of the Sealant Waterproo ng and Restoration Institute. A key point of the presentation is that a moisture management solution for the rainscreen building envelope requires a systemic/holistic approach. There is no single magic bullet; it takes a well-thought-out, coordinated system of products and processes designed and implemented by a team of professionals working collaboratively at every stage of the project to reach a successful outcome. 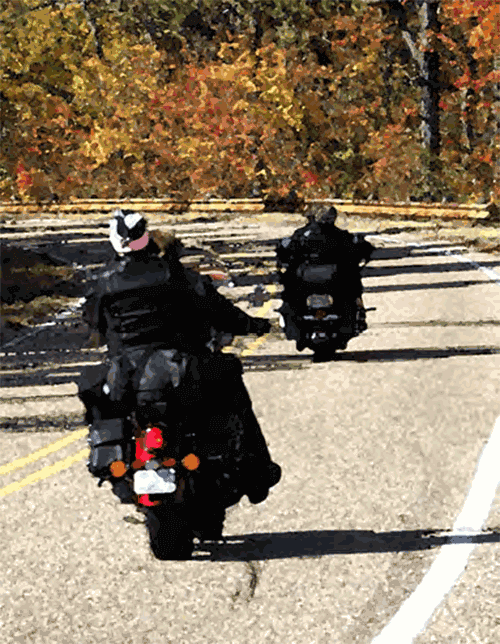 To illustrate the importance of a coordinated system in moisture management, I’ll use the analogy of a motorcyclist riding towards an approaching storm. It’s a nice sunny day, so I decide to go for a motorcycle ride. Being an experienced motorcyclist, I always have raingear in my saddlebags because it’s summer and anything is possible! As I move through the countryside, I notice that the sky is darkening and a storm is imminent so I pull over and put on my rain suit. In a matter of minutes, the rain starts. It’s light at first but soon becomes heavy, and it’s coupled with a driving wind. Rain is forced around my windshield and into my eyes greatly limiting my ability to see the road. Water cascades off my helmet and runs down the back of my neck soaking my shirt. The water on the highway flies upward leaking into my boots through the seams and around the tongue. To make matters even worse, it’s a hot, humid day so beads of condensation start to form on the inside of my rain suit making for an increasingly miserable rideObviously evenen though I thought I was prepared for rain, I hadn’t looked at all possibilities.” Even though I had a collection of items designed to keep me dry, I hadn’t fully thought through the outcome, and I hadn’t properly combined the items into a functioning system. If I had used goggles or a helmet with a visor, I could have seen the road better. If I had used the hood on my jacket and worn it under the helmet, I wouldn’t have gotten rain down my back. If I had used a rain jacket with vents, air could have moved around inside the system and reduced the condensation. Finally, had I worn rain boots with my rain pants lapped over the top of the boots and fastened snugly, I wouldn’t have gotten wet from the water spraying up from the road. So what can be learned from this analogy about the importance of a system in solving the building envelope moisture management problem? Hopefully, it’s that simple solutions don’t always work. As much as the motorcycle rider would like to just throw on a waterproof jacket and waterproof pants and be off again, it just doesn’t work. It takes many products, put on in the right order and at the right time, to create a positive result. We need to look at how many factors are in play and then employ several moisture management solutions as part of a system to solve the problem. 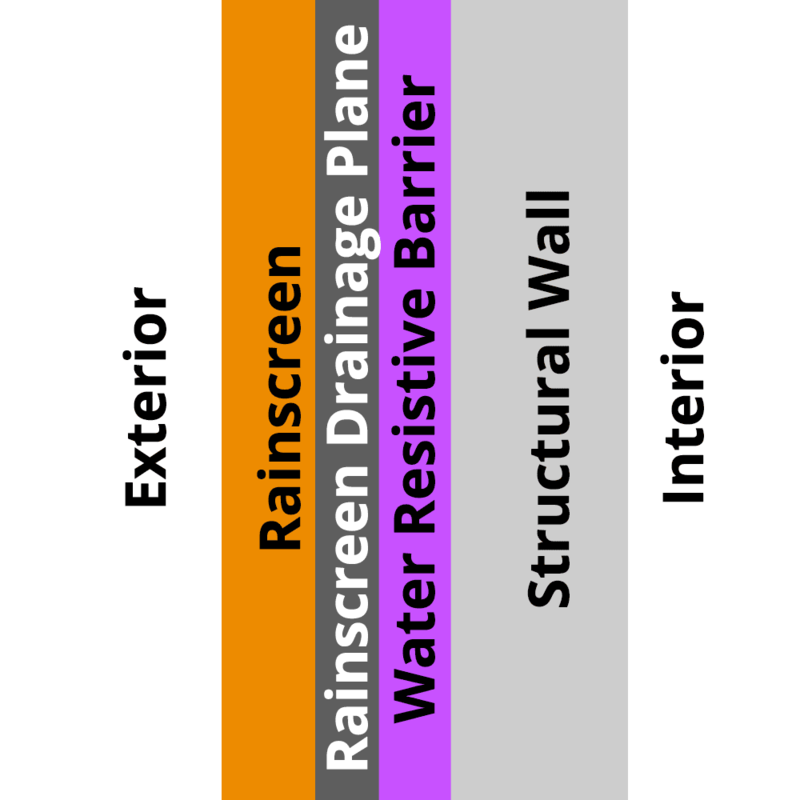 Rainscreen walls with a wide variety of veneers are sustainable when combined with the right moisture management system. This effective moisture management system includes three key components. 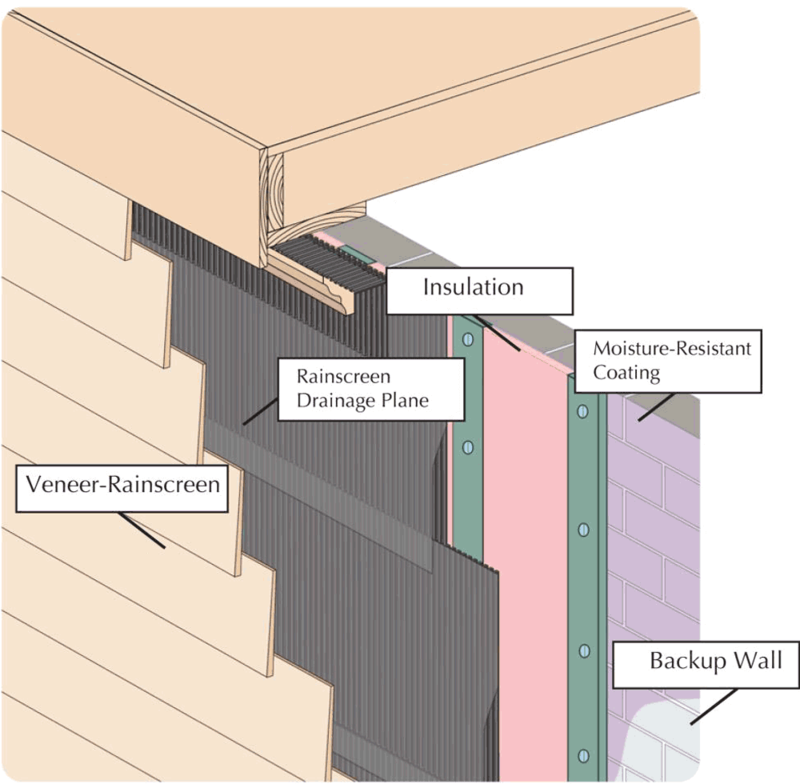 First, there must be a space from the backside of the rainscreen (veneer) to the face (exterior surface) of the WRB. (The minimum depth is still being debated, but should be at least 1/8”. In Canada 10mm is required.) This space must be uninterrupted, predictable, constant and stable, and the materials used to create it should have very low absorbency. Second, we need to dump the water (weep holes) out of the rainscreen drainage plane at every possible opportunity. 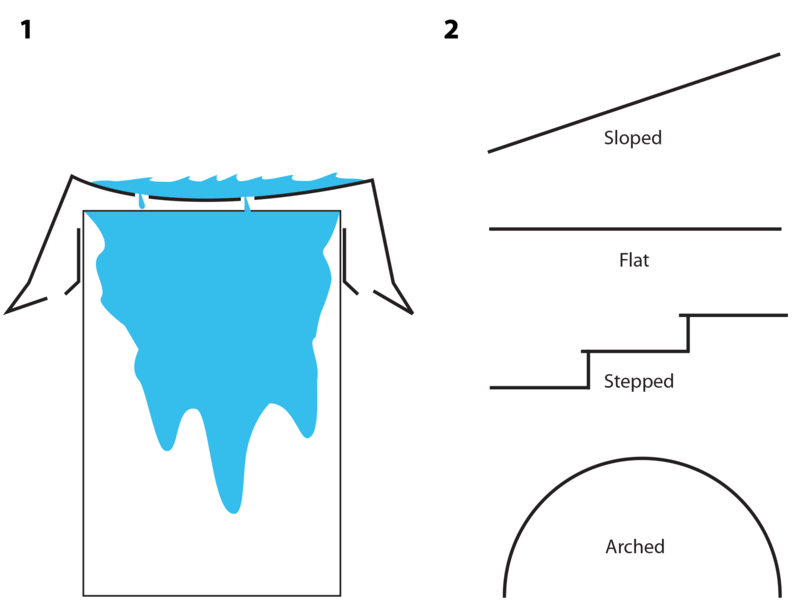 Water should be dumped at transition details (e.g. brick to stucco, siding to brick or stucco, etc. ), projection details (e.g. windows at top, windows at bottom) and wall terminations (e.g. bottom of wall, top of wall). The final component is air pressure control. 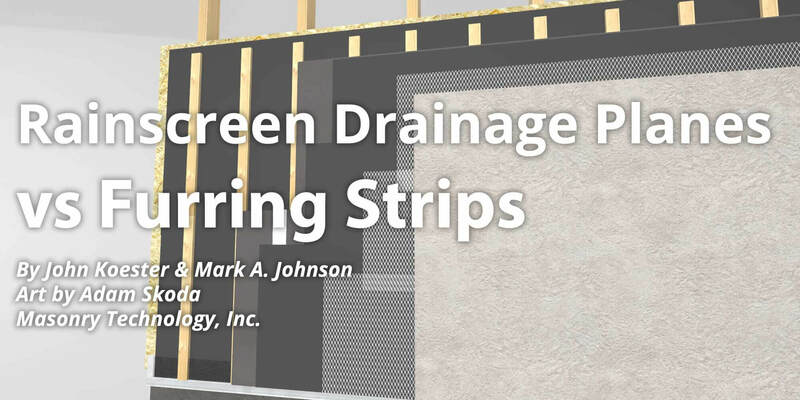 A well-designed rainscreen drainage plane system helps maintain pressure equalization. It lessens the chance that high-pressure air, contaminated with moisture, will move from high pressure to low pressure and deeper into the building envelope. And with venting at the top and bottom of the wall, air ow may assist in drying the building envelope. (Figure 12.) Lu Bu Wei, a Chinese philosopher wrote, “It follows, then, that all things work together...The Sage examines them in order to observe their similarities.” In other words looking for one simple solution to preventing mois- ture problems in something as complex as a modern building is unrealistic. There are too many things that come into play: materials used, the laws of physics, the people involved, location/climate, the many systems brought together in the building. To reach a true “waterproofing” result we must work together as a team and we must create the right moisture management system. And that’s the hole/whole story! The construction industry and more specifically, the building envelope sector of the construction industry, seems to embrace the status quo with exceptional tenacity. There are obvious reasons for this unwillingness to change. Manufacturers of products currently utilized in building envelopes don't want to see change, and many tradespeople don't want to learn new techniques. “For time and the world do not stand still. Change is the law of life. And those who look only to the past or the present are certain to miss the future.” John Fitzgerald Kennedy The idea that “Change” is a law of life has been proven true again and again since the dawn of time. In our own lifetime think how much technology has changed the way we live in just a few short years. And yet we seem so slow to change. Many of us actually dread the idea! Our present habits are like the comfortable old jeans we refuse to throw out despite the stains and holes. Resistance to change is as predictable as the knowledge that change is inevitable. The construction industry and more specifically, the building envelope sector of the construction industry, seems to embrace the status quo with exceptional tenacity. There are obvious reasons for this unwillingness to change. Clearly, manufacturers of products currently utilized in building envelopes don’t want to see change unless they have another product that fits with the new way of doing things. Also, many tradespeople don’t want to learn new techniques when current practice has served them well for so long. There is a long list of players who could be negatively impacted by the implementation of new technologies, new materials and new techniques including the shipping and storage industry, unions, contractors, raw materials producers, architects, specifiers and codes officials. Building is a complex process, and there are countless individuals and organizations involved. 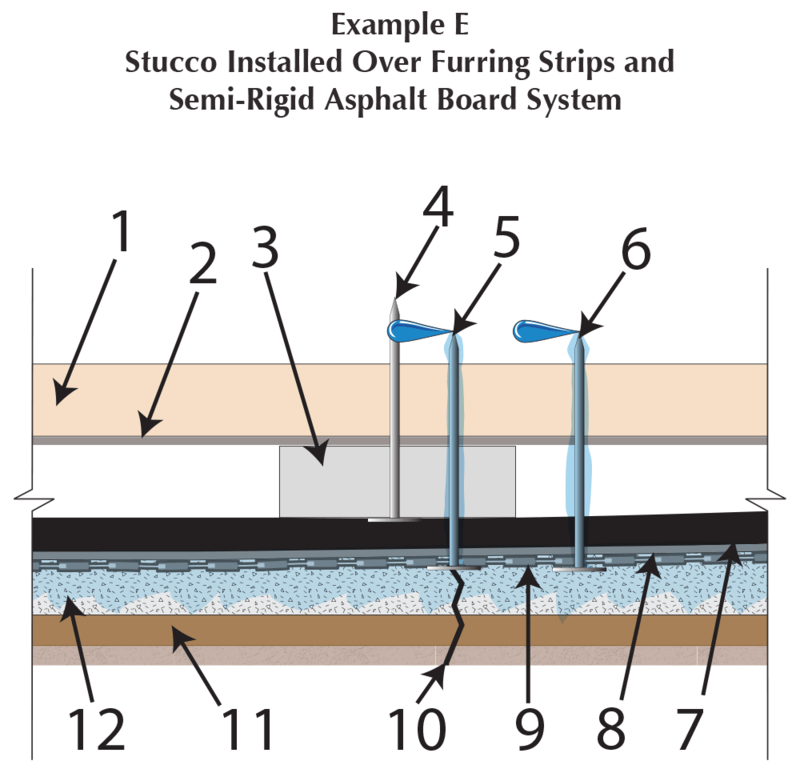 The furring strip rainscreen drainage system pictured in Examples A and B interrupts moisture at the building paper slip-sheet surface installed in front of the semi-rigid asphalt board but doesn’t provide a designed detail for this obstructed moisture to drain to the exterior (See Example B – Top Down View). 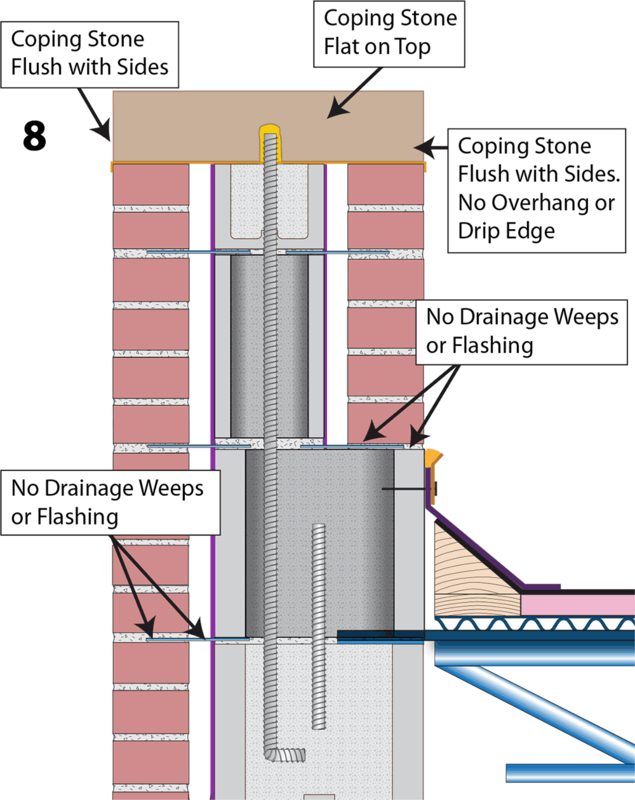 The required drainage that must be provided in front of a moisture “water stop” has a long history of being misunderstood and is often improperly detailed or even omitted in the design and construction of the exterior building envelope. 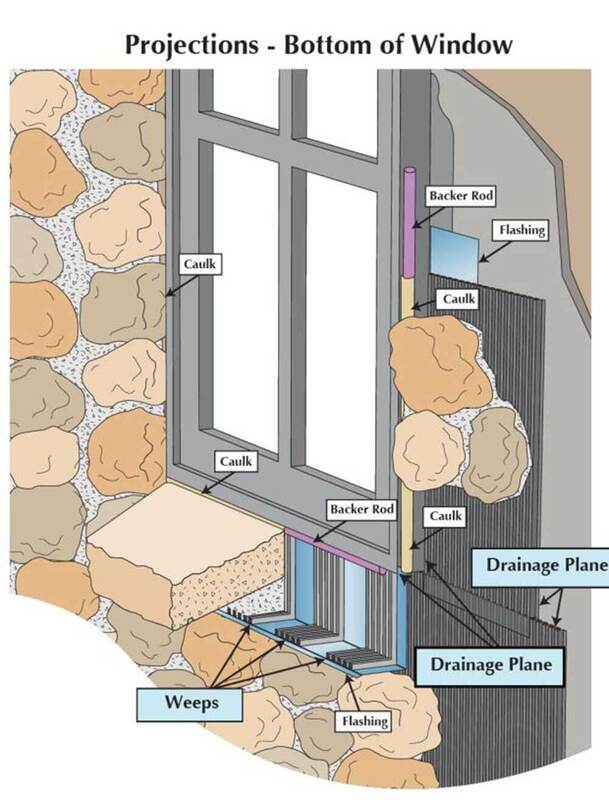 The root cause of this problem may be the construction industry’s unrealistic comfort level with the idea of “waterproofing.” The reason for waterproofing’s preeminence can be at least partially explained by the petro-chemical industry’s rapid growth resulting in large volumes of byproducts in need of disposal (e.g. coal tar pitch from the coking of coal, asphalt from the distillation of petroleum, etc.). When these byproducts were found to be excellent waterproofing materials, a market was needed; enter the construction industry! Prior to this period, about 125 years ago, various types of metals such as copper and lead, and some tree pitches and animal fat impregnated fabrics, were the only moisture-resistant materials available. The construction industry’s only real moisture control was slope-to-drain. Slabs and boards of semi moisture-resistant material were installed shingle-fashion on roofs with high pitches; they were also installed vertically on walls. Coal tar pitch and asphalt changed all that and led to developments like “low slope” or “flat roofs.” The petro-chemical industry modified and improved on these original materials and also added many high-quality synthetic waterproofing materials. These abundant, high-quality waterproofing materials distracted the construction industry’s attention away from the need for drainage. 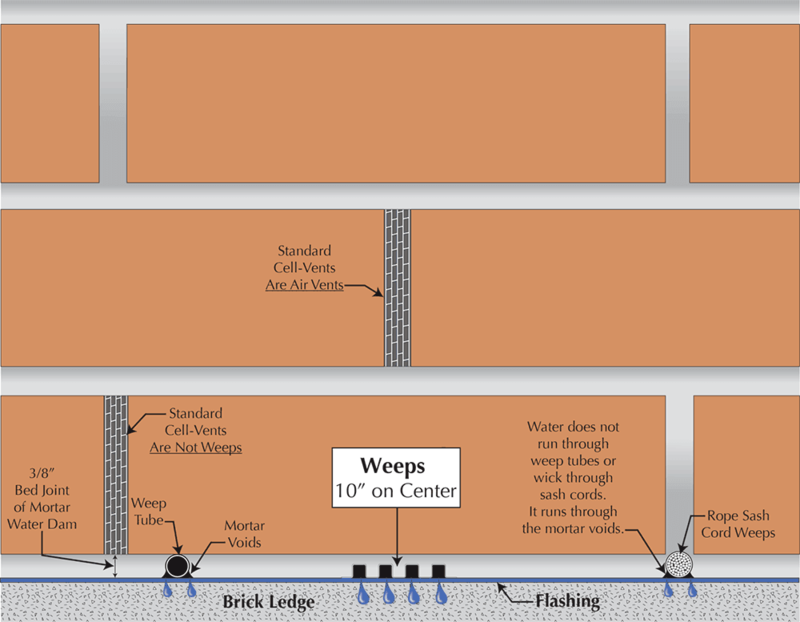 With the avalanche of building envelope failures over the last two or three decades, the need for the inclusion of drainage in the building envelope moisture control equation has become increasingly clear. 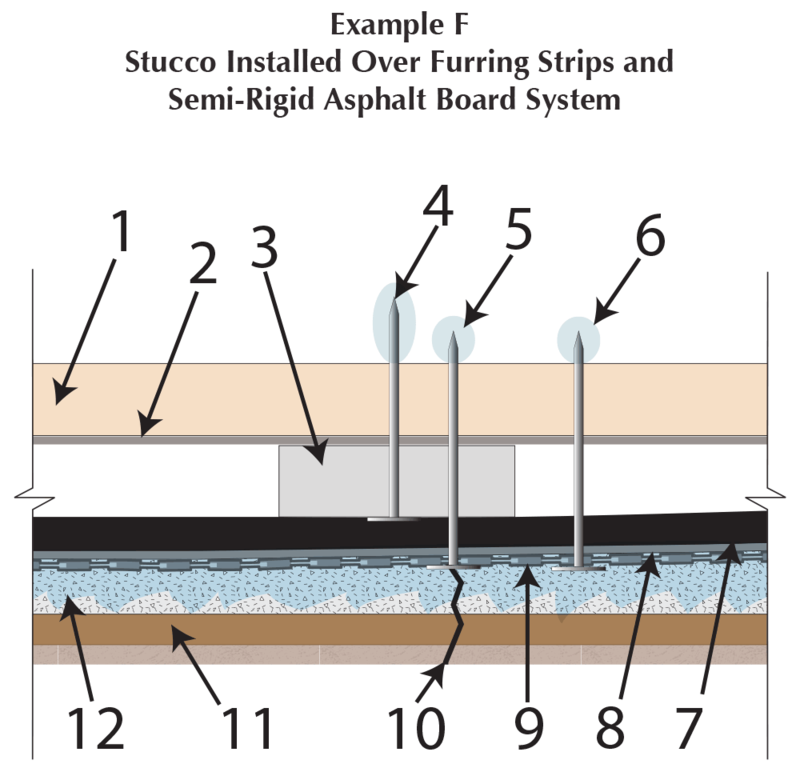 Furring strips were an early answer, and were, at least for a time, an imperfect solution. However, the placement of the furring strips created a new problem. 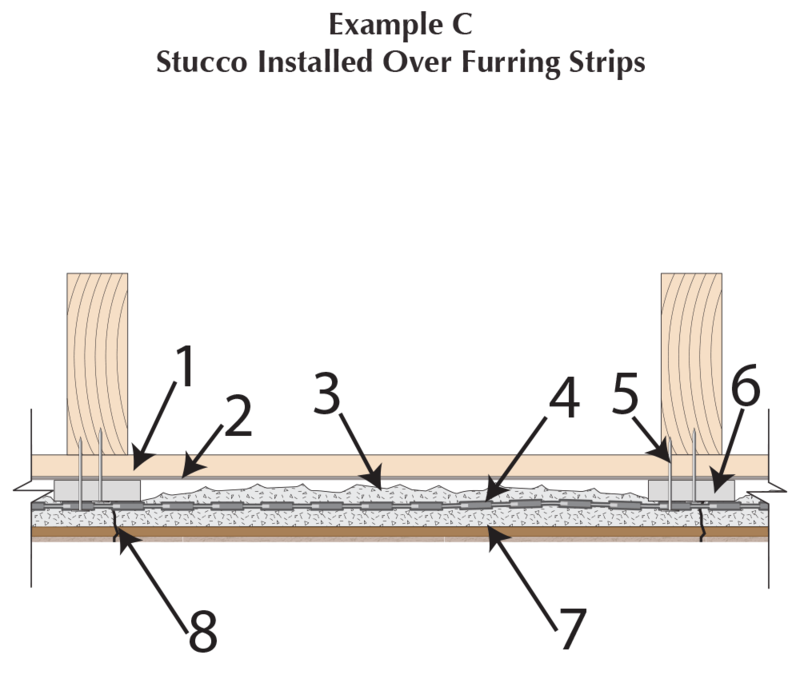 The early use of furring strips to create a drainage plane looked something like Example C. The furring strips, attached at each stud location, pushed against the scratch coat of mortar bellying it out and allowing the furring strip to come in close proximity to the stucco lath. 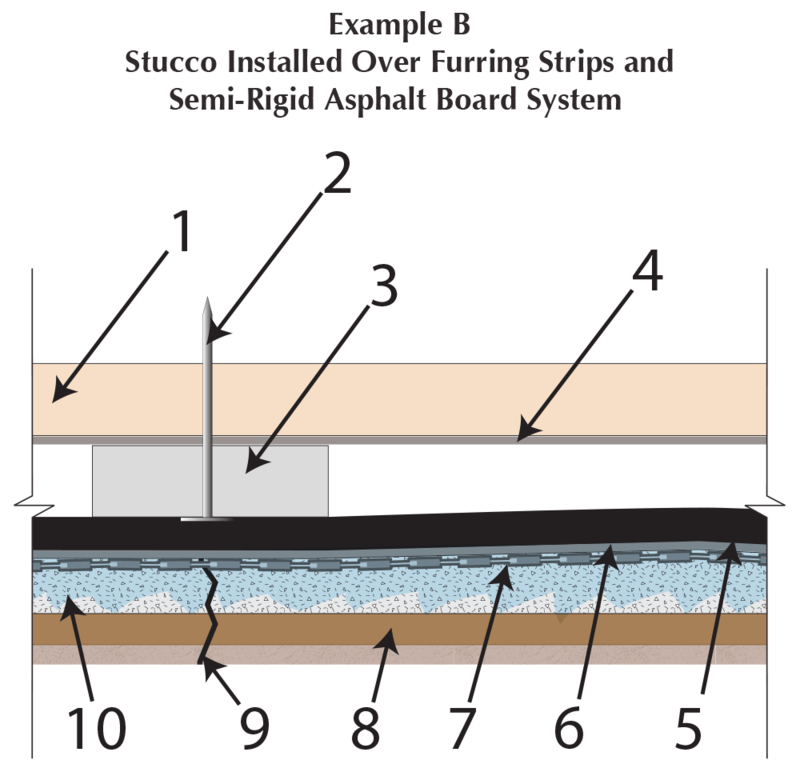 This created a much thinner layer of stucco at each furring strip and often led to stress cracks in the three-course stucco. 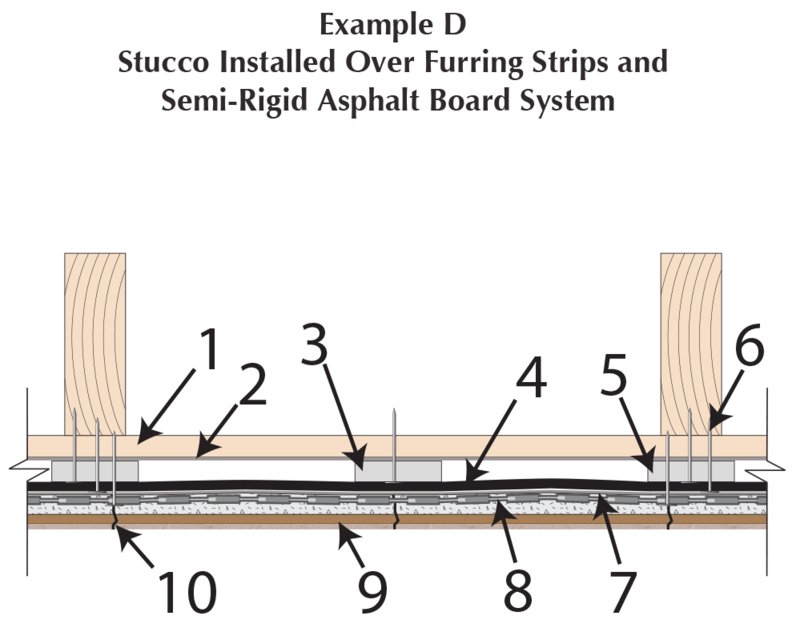 (See #8 Example C) In an attempt to improve this application, an additional furring strip was installed midway between the 16” on- center furring strips. (See #3 Example D) This alleviated some of the bellying/cracking problem, but it also created a new issue. The labor forces would occasionally fasten the expanded metal lath to this nonstructural termination (the intermediary furring strip); this resulted in more extreme cracking. 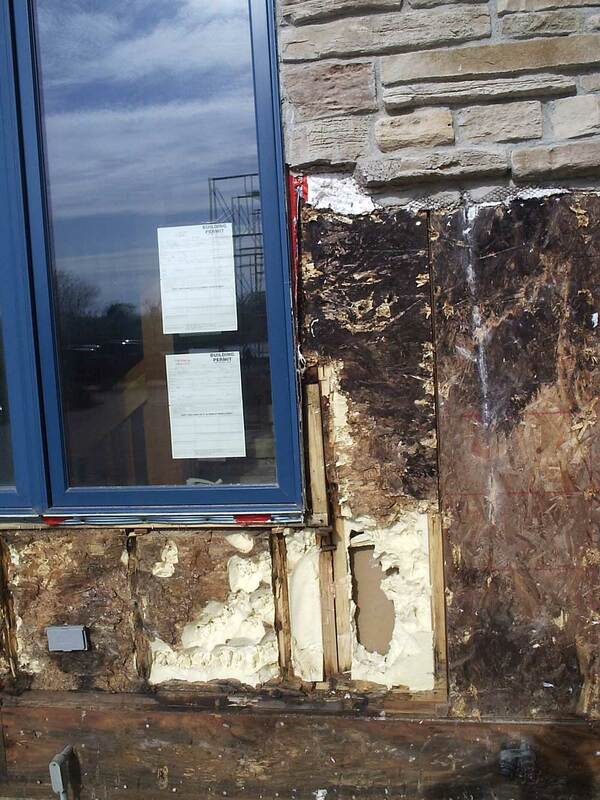 Excessive, uncontrolled cracking in the rainscreen of the exterior building envelope is unsightly, and it creates an opportunity for excessive moisture to egress into the rainscreen and potentially deeper into the exterior building envelope. To make matters worse, the cracks were occurring at fastening points. 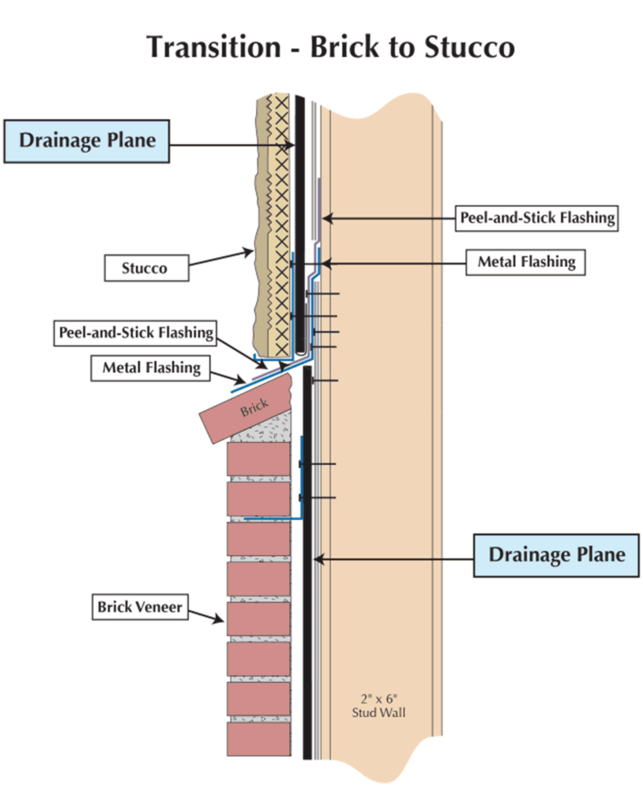 This fact potentially allowed egressing moisture to have a direct pathway along fastener shanks and into the stud cavity (See #5 & #6 Example E). All because the labor force incorrectly used non-structural details as attachment points. Incorrect placement of fasteners that penetrate to the backside of the backup wall sheathing and on through to the backside of roof sheathing does cause real “leak” issues. However, the moisture patterns seen on the backside of the sheathing may not be from egressing moisture! Instead, they could be a water pattern caused by the melting of frost balls or the run off of condensation. What is really happening is that the shanks of the misplaced fasteners may not be pathways for liquid moisture; rather, they are pathways for cold temperature. The result is the points of the misplaced fasteners are cold enough to create dew points that in turn allow for condensation in the form of frost balls or water droplets (See #4, #5 & #6 Example F). So the old technology seems to have quite a bit of room for improvement. These four manufacturing procedures are used to create six of the major product lines that represent the new “mat” rainscreen drainage plane technology in North America. They differ from one another in drainage efficiency, compressive strength, and ease of installation. What they all bring to the construction industry, and specifically to the exterior building envelope segment of the construction industry, is ease of installation and in most cases, a more predictable cost-effective rainscreen drainage plane. When choosing which one of these new rainscreen drainage plane technologies to use in your next project, select the one that best suits your veneer/rainscreen type and one that has a CCMC evaluation number. Parapet Walls – What Are They Good For? They help prevent roof edge blow off by diverting air flow up, over and away from the roof edge. They can be a stable termination point, for roof edges and flashings. 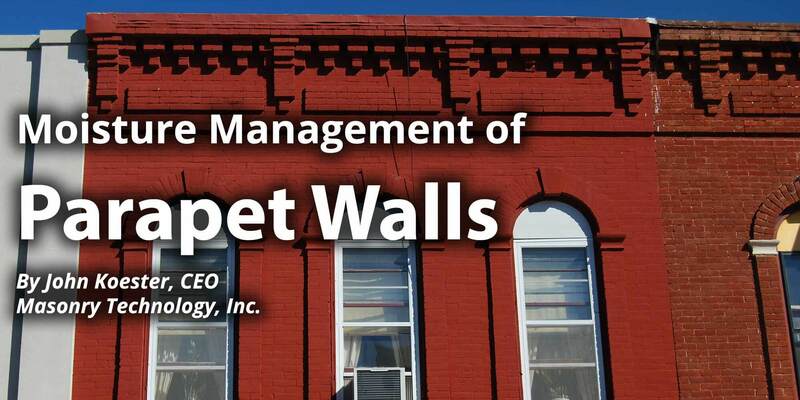 However, even though parapet walls perform a number of important functions, they are moisture management headaches! The phrase ‘Out of sight out of mind” is, unfortunately, the rule of the day with construction details that are not easily accessible. Parapet walls fall into this category. The required timely maintenance is neglected because of this and regrettably, the need for maintenance becomes apparent only as a result of a failure such as a leak. On top of this, parapet walls have a rather rough life since they are subjected to wind, dramatic temperature changes, moisture from three sides and roof system stresses. The result is a construction detail that is both neglected and abused. 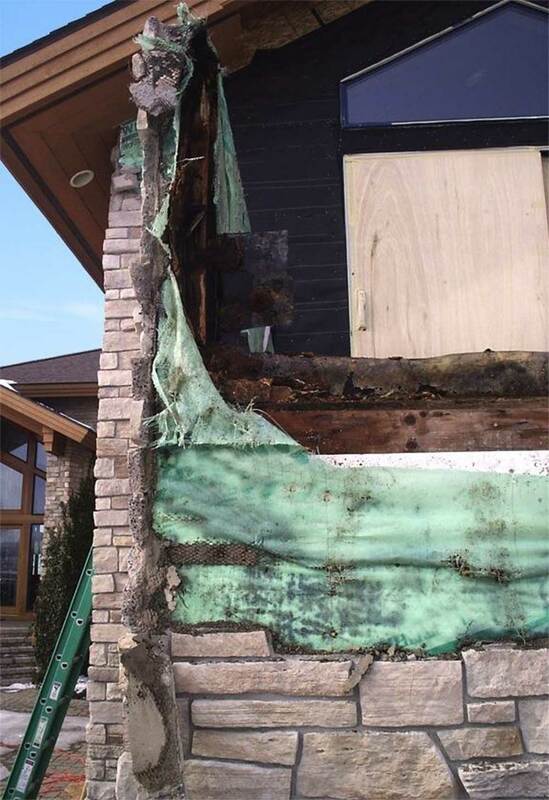 The answer to the question “Why do parapet walls fail?” seems obvious. The solution is just as obvious – design them to be better and maintain them properly. 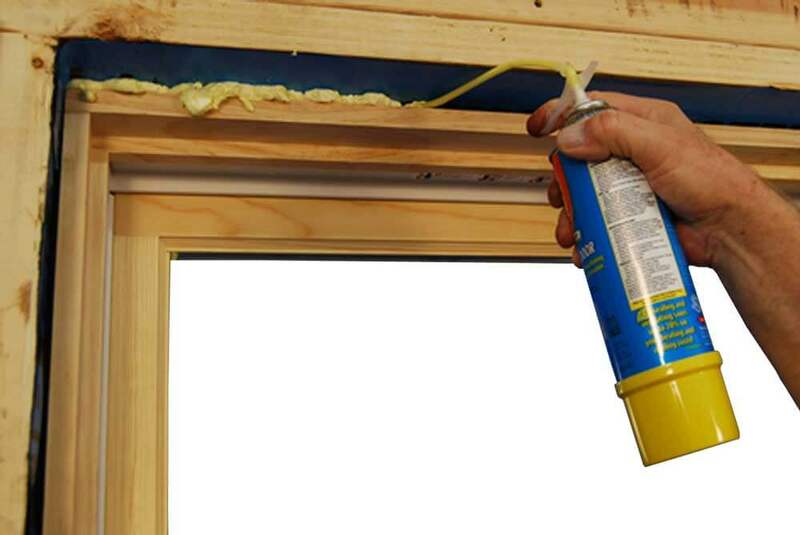 The most fundamental rules of moisture management “Keep moisture away from, off of and out of a construction detail” and “Move moisture away as quickly as possible” always apply. However, two additional practices should be employed. First, use good moisture management design and identify and isolate the moisture risk zones in such a way as to separate high risk from lesser risk. Of all structural components, the exterior building envelope (roof and walls) is the first opportunity for moisture management. The roof of a parapet wall is the coping and like other roof systems, there is a wide range of roofing styles and materials. So designing a maintainable coping system for a parapet wall and maintaining it properly is the starting point for designing and maintaining a parapet wall. 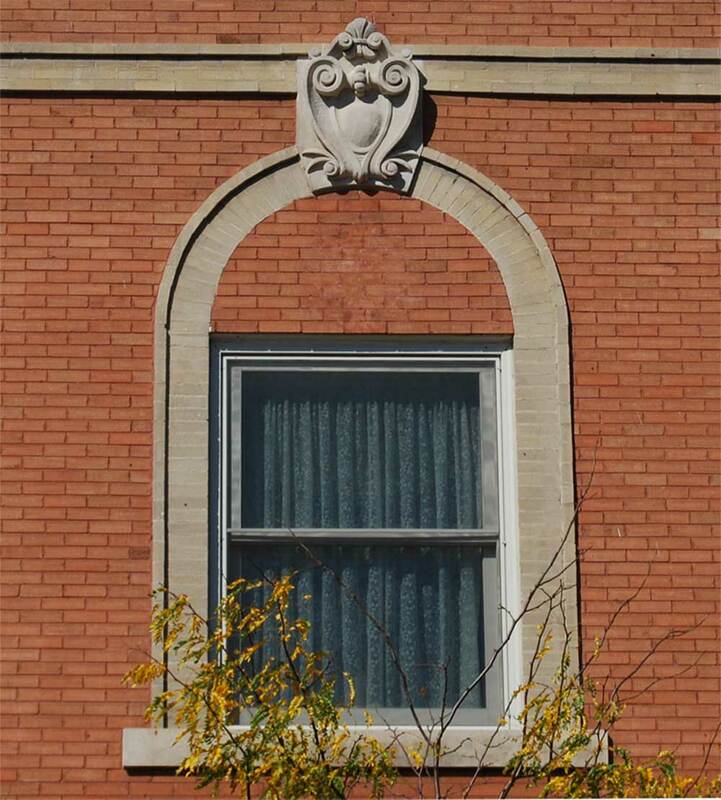 Like other exterior building envelope walls of the past, most parapet walls were solid masonry. 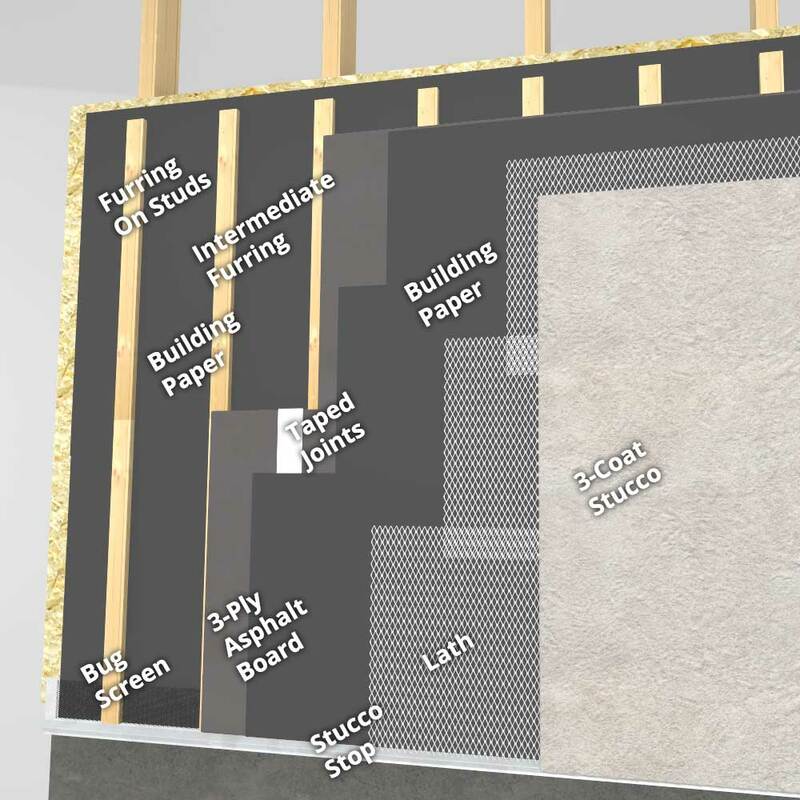 As the construction industry’s need for more economical wall systems came about, cavity wall and thin veneer stud walls became the norm, and with the changing construction details came new and unexpected challenges. However, one thing didn’t change – the “environment” that parapet walls have always faced. Regardless of the configuration, they all have top surfaces. How this top surface is addressed can depend on a number of factors (building type, architectural style, building materials, etc.). However, since the top surface of a parapet wall is the roof of this construction component, it must be detailed accordingly. It must be waterproof or at least highly moisture resistant. How waterproofing and how moisture resistant depends on how much moisture is going to come in contact with the top of the parapet and in what form (rain, snow, ice, etc.). Of course there are many other environmental factors to take into consideration (wind loads, temperature fluctuation, etc.). This decision making process is complicated when climate sensitive architectural styles are imposed into alien climates. 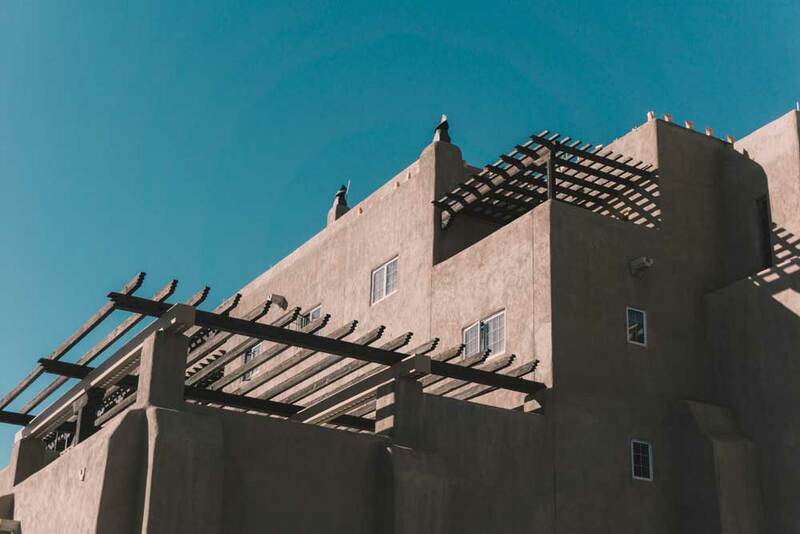 (Example: Southwest/Adobe into high moisture Northeast U.S. locations) (See Image 3) The architectural style requires one look and climate conditions demand another. 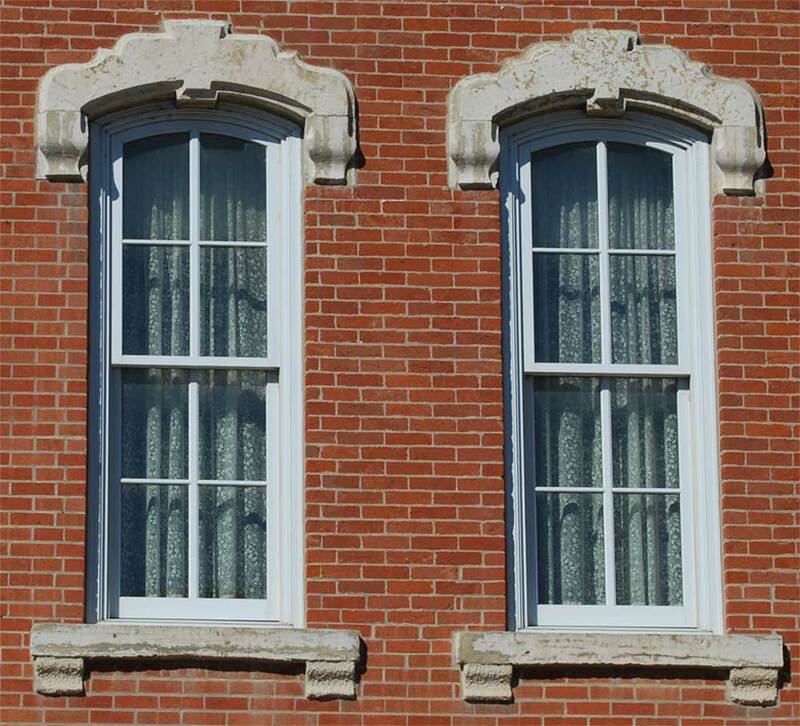 The moisture management compromises that are required to accommodate these architectural styles, in some cases, are building envelope disasters. So how do we design and construct a high quality, maintainable parapet? We start by identifying its moisture management risk factor and that is easy. It is a very high-risk moisture management construction detail with unique moisture management provisions required. The more difficult decision of a designer is where does a parapet wall begin and end? If you are standing on the roof of a building, identifying where a parapet wall begins and ends is easy. If you are standing on the ground looking up at the exterior of a building, the point where a parapet wall begins and ends is not so obvious. Intuitive thinking tells us we only need to manage moisture moving from a high point to a lower point in this construction detail. But the reality is that we also need to be concerned about moisture moving up into the parapet from construction details that are located below the parapet. That’s why we need a water stop. The parapet wall and the exterior walls that enclose the interior space (living area) of a building exist in two very different environments. 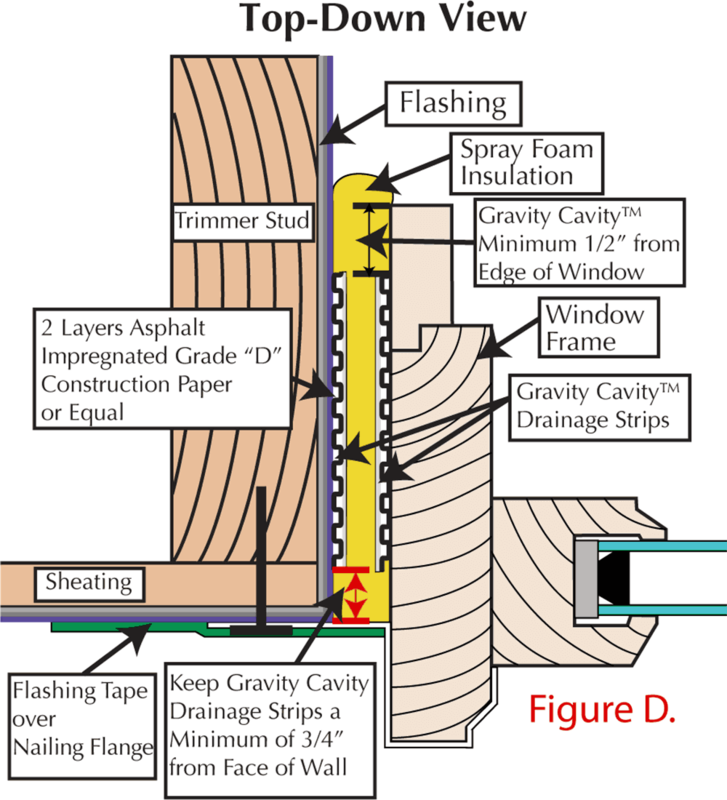 What is initially thought to be a leaky parapet or roof-flashing detail may well be water vapor that has moved up the cavity of the exterior building envelope, into the cavity of the parapet wall where it is cooled. 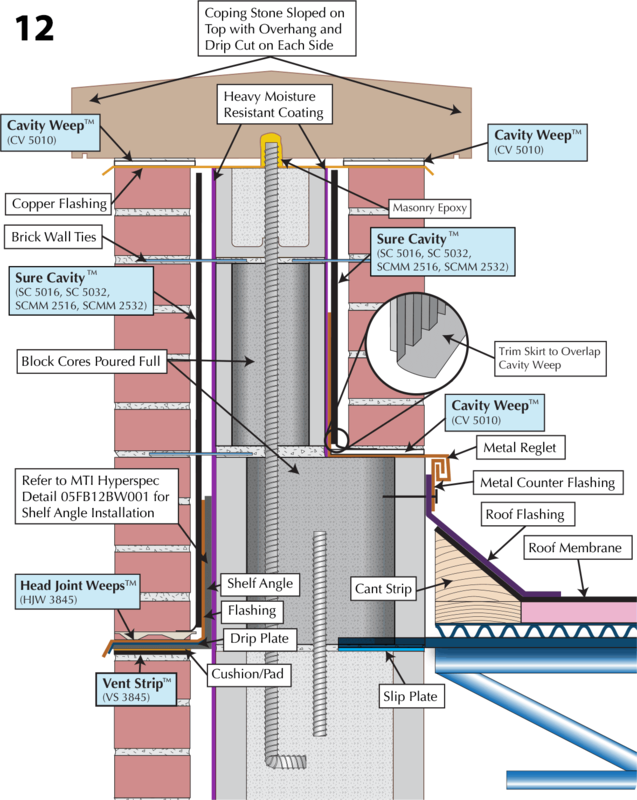 The condensates then run back down the cavity and into the other exterior building envelope details. This moisture can find its way deeper into the coping detail and cause deterioration. Moisture can cause excessive stress on coping materials, expansion and contraction stresses from freeze/thaw cycles. 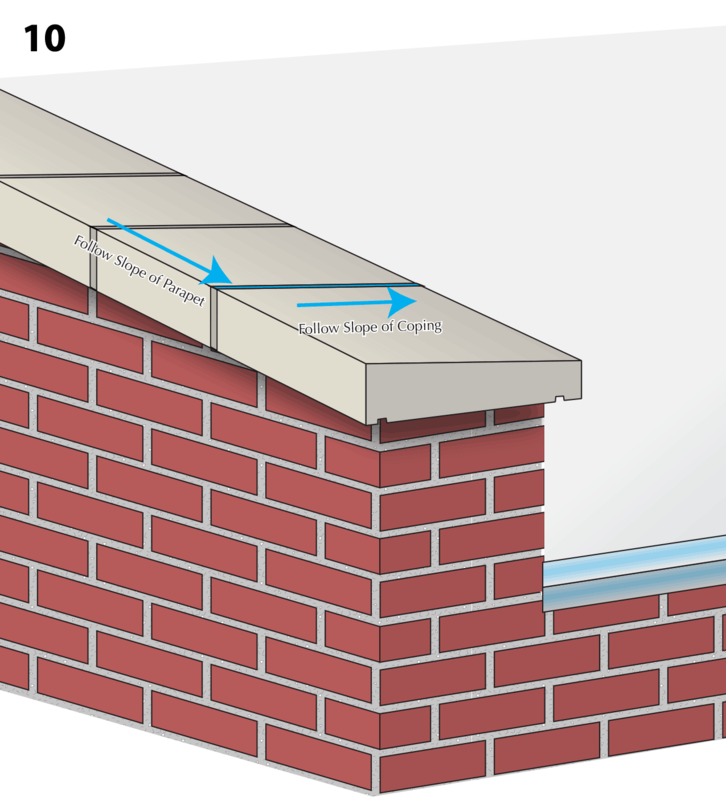 Good coping overhang from exterior surface of parapet wall with a well-designed drip edge allows the moisture that runs off the top surface of the coping and down the side surface of the coping to drip freely from the coping and away from the wall surface of the parapet. This helps prevent moisture deterioration of the parapet wall in the following ways. When sheet metal is bent and formed into a desired shape, stress is built into the metal part and over time, the temperature cycles from hot to cold or from cold to hot allow a releasing of this built-in stress. In this case the sheet metal part is the coping that is trying to return to a flat sheet metal. 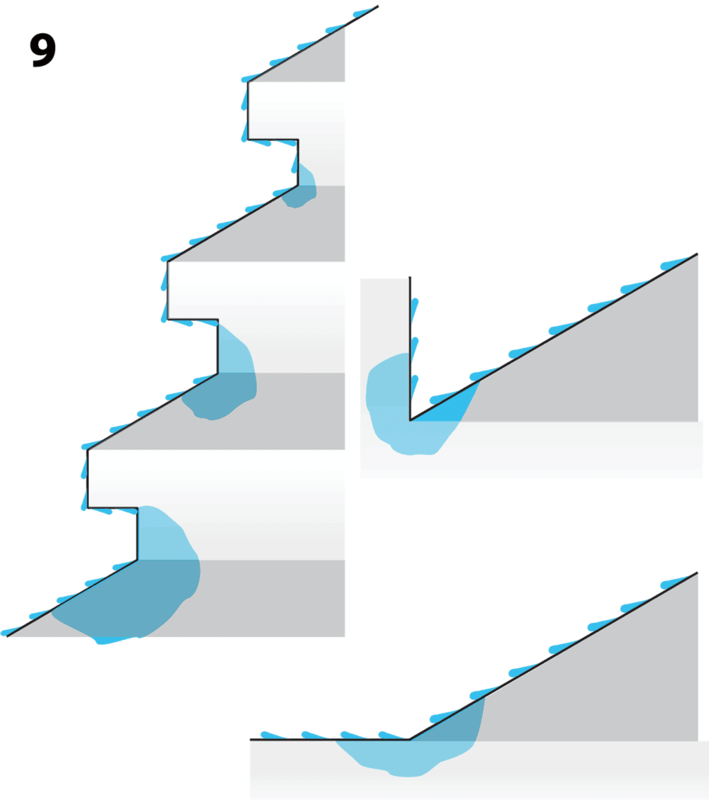 In many cases this change in shape results in a concave cupping of the top of the metal, this creates a ponding configuration in the coping. 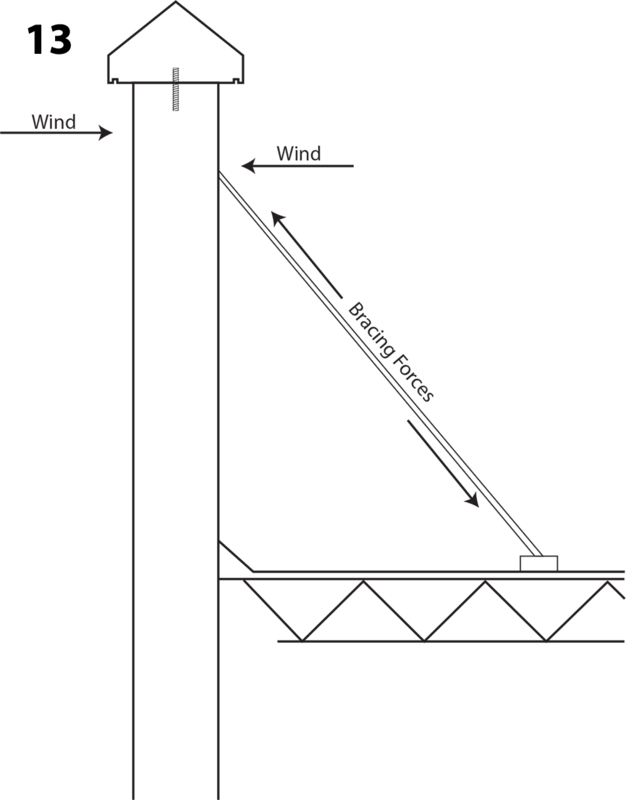 Wind is another stressor, creating movements of other components of the parapet wall and adjoining exterior building envelope details (Roof details etc.) This added movement could deform seams in the metal coping creating openings in the waterproof system. Any available water can then leak into the building envelope. These environmental stressors can also negatively impact other materials (natural stone, manmade stone, bell tolls, etc.) that are used to create coping. The design task is to create a coping that is strong, yet flexible enough to allow for expansion and contraction. Copings are truly working, moving construction details and like all mechanical designs that move under stress, they need to be examined occasionally for wear. They need to be maintained! Misunderstanding of how a drip edge works on the bottom edge of a sloped parapet coping can result in a similar condition. 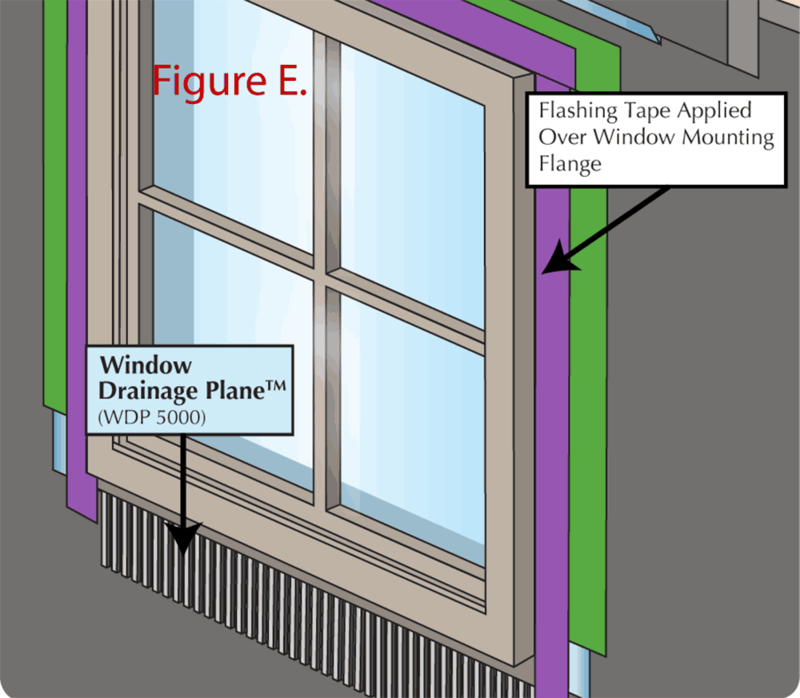 (See Image 11A) This can also occur on the bottom edge of a cap flashing when a cap flashing is used to protect the top of a parapet wall when installed under a porous coping stone. 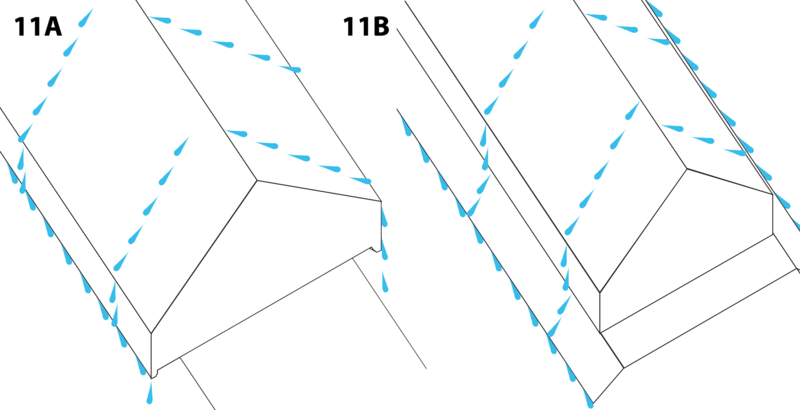 (See Image 11B) The body of a parapet wall should incorporate the same good drainage design and details of other walls of the exterior building envelope. 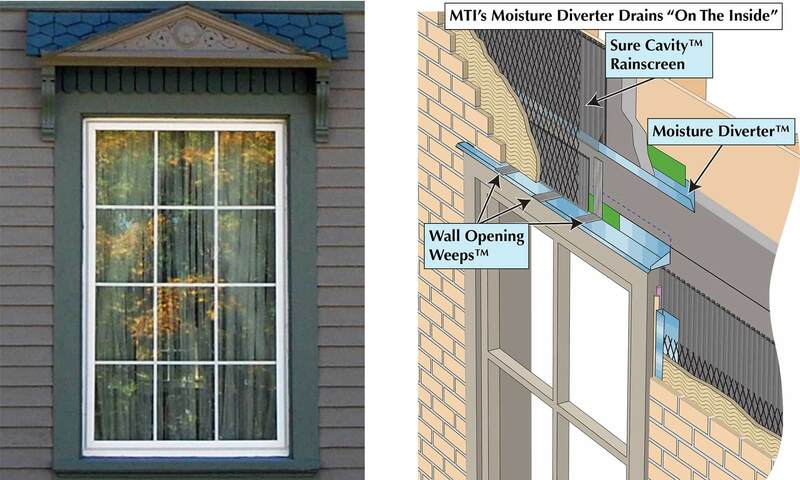 A designed detail that allows moisture that makes it through the veneer / rain screen to drain from a high point of enterance to the lowest point of the parapet (the top surface of the flashing) and out of the wall through the weep system. 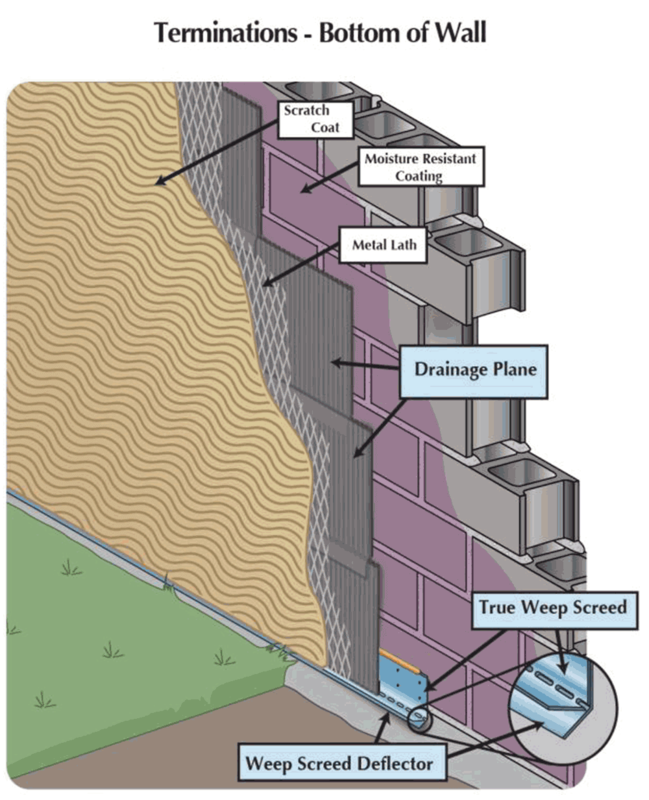 This vertical void is called a rain screen drainage plane in thin veneers and a cavity in brick or other masonry veneers and also a core in concrete masonry unit (CMU) single wythe walls. Structurally stable parapet wall; a structurally unstable construction detail cannot be successfully maintained. The intersection of the backside of the parapet wall and the roof perimeter flashing detail is a complicated, highrisk construction detail. It is always prudent to follow the moisture management rule of identifying and isolating high-risk moisture management details from lower risk moisture management details. In this case it is an absolute must! The exact design that connects the parapet wall and the roof system will vary with the type of roof configuration and type of roofing materials, but the concepts do not. 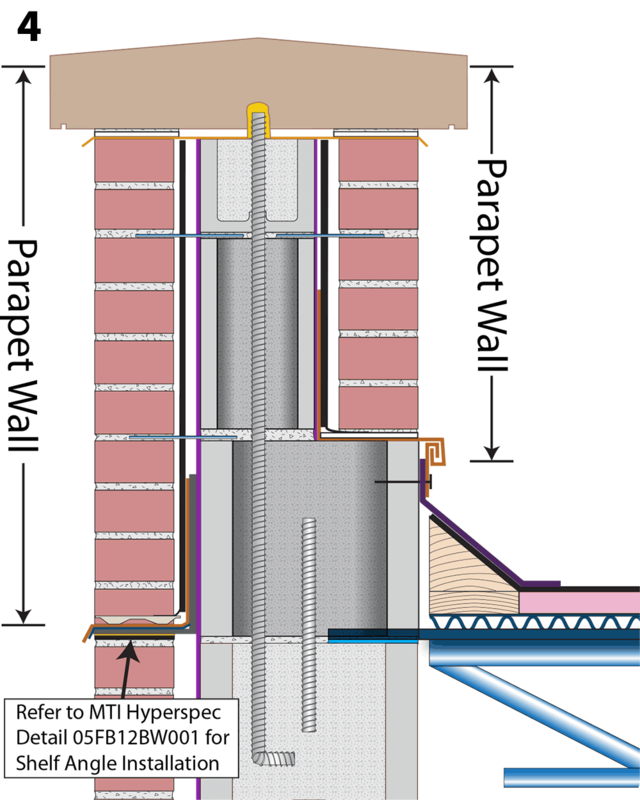 The moisture management bridging of the intersection of parapet walls and roof systems is one of the critical design efforts; the other is the connecting detail. The connecting details ranges from nailed or bolted right together to barring on with a slip plate type of detail to a structurally detail completely separate. 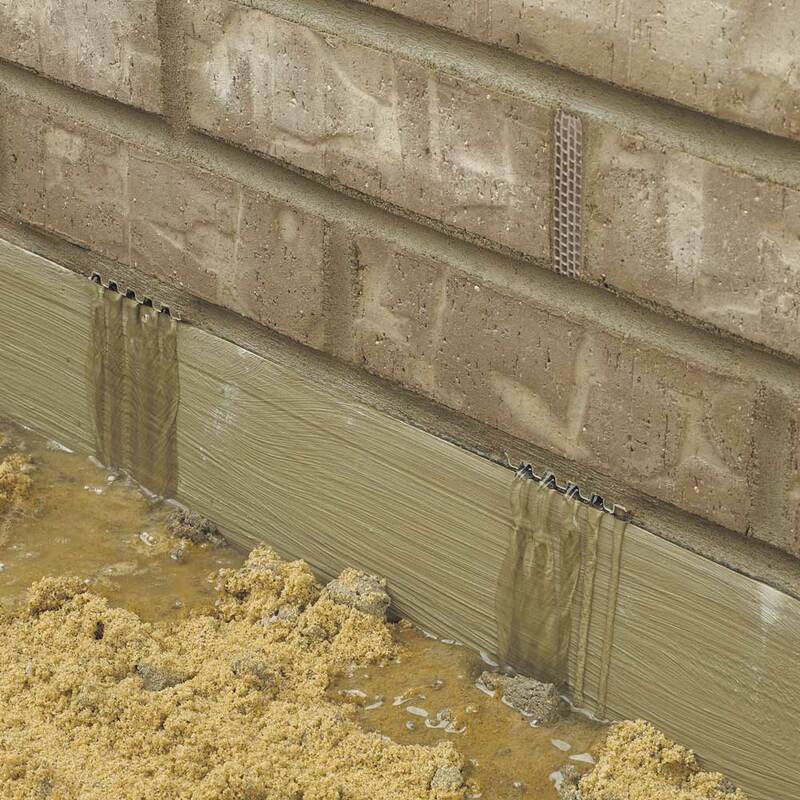 (See Images 12A-D) This wide range of connecting details will deter the moisture management type of bridging detail and flexibility should always be top priority. Good building envelope moisture management, it’s all about the details! Building on a strong foundation has been a well-recognized principle of construction for thousands of years, but we still continue to violate the concept. 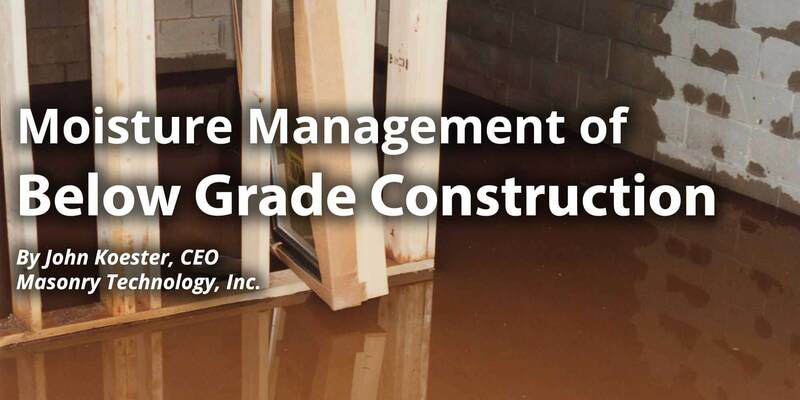 One of the most violated areas of below-grade construction is the failure to include moisture management.